Planets and their host stars evolve with time, and the first few hundred million years are thought to be the most formative. Assembly of the core of giant planets likely occurs in the first 10 million years, and final formation of rocky terrestrial planets in the first 10-100 million years. Planets may evolve for several hundred million years after this due to accretion of residual planetesimals, loss of their atmosphere from X-ray and UV emission from the star, and gravtiation interactions with other planets or companion stars (if present). Most planets discovered to date are much older than the timescales of interest. Kepler target stars, for example, are overwhelmingly more than a billion years old. Further, young stars are noisier, making it difficult to detect young planets through the transit or radial velocity methods. Direct imaging can detect young planets, but is generally only sensitive to > Jovian-mass objects far from their host star. So we remain relatively ignorant about the critical period of planetary evolution (right). 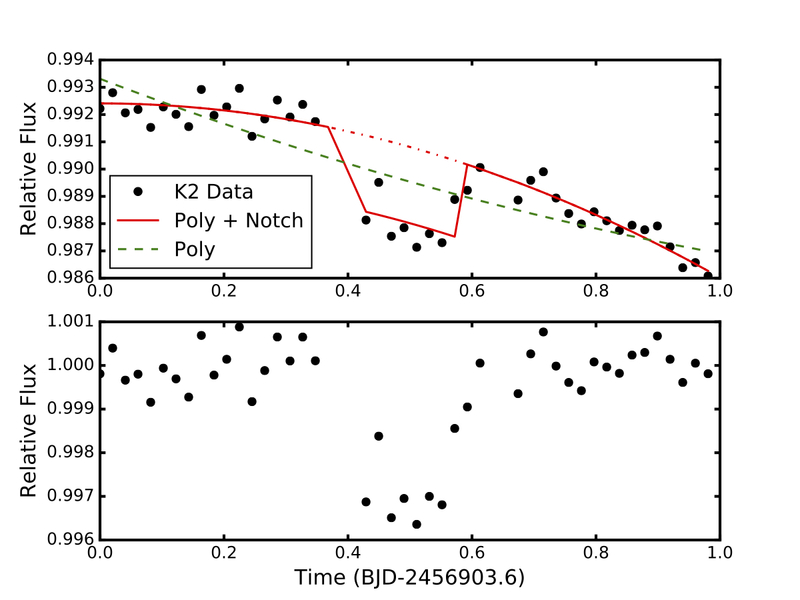 The Zodial Exoplanets in Time (ZEIT) survey focuses on filling this gap by identifying transiting planets in K2 (repurposed Kepler) observations of young clusters and OB associations. 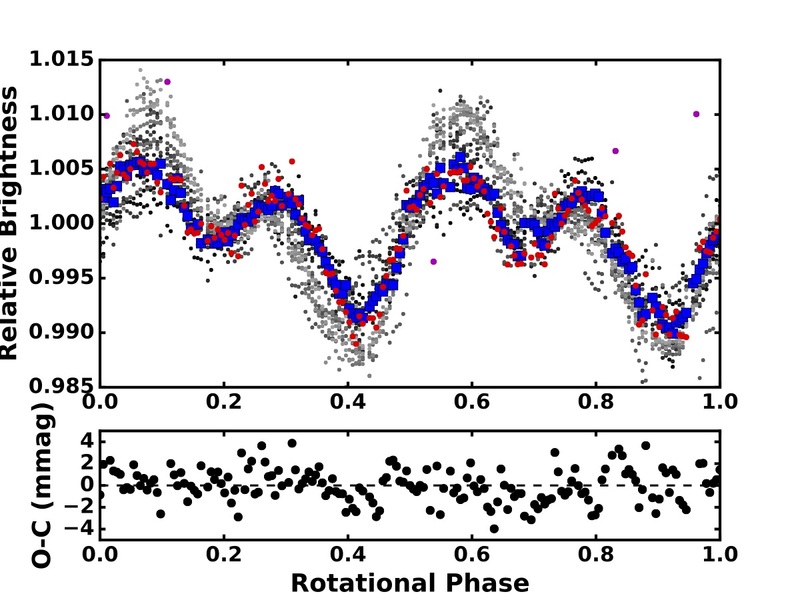 The photometric precision and continuous observing from K2 enables us to fit out much of the stellar variability, revealing planets as small as 1.5 Earth radii. So far we have already identified systems in Upper Scorpius (~11 million years old), Hyades (650 million years old), and Praesepe (650 million years old). These discoveries have already revealed that young planets are larger than their older counterparts (right) and helped place constraints on the exoplanet migration timescale. Distribrution of known planets (grey points) with systems known to be young as stars, color-coded by the detection technique used. Planet radii (in Earth radii) as a function of stellar host-star mass (in Solar masses). 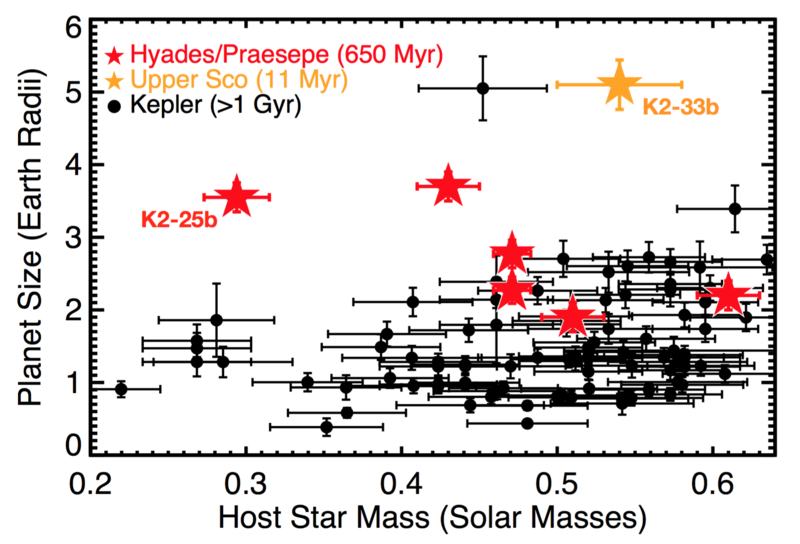 The red/orange stars are young planets from the ZEIT survey, while black points are older planets from the Kepler survey. The young planets are statistically much larger than their older counterparts, even accounting for survey bias. 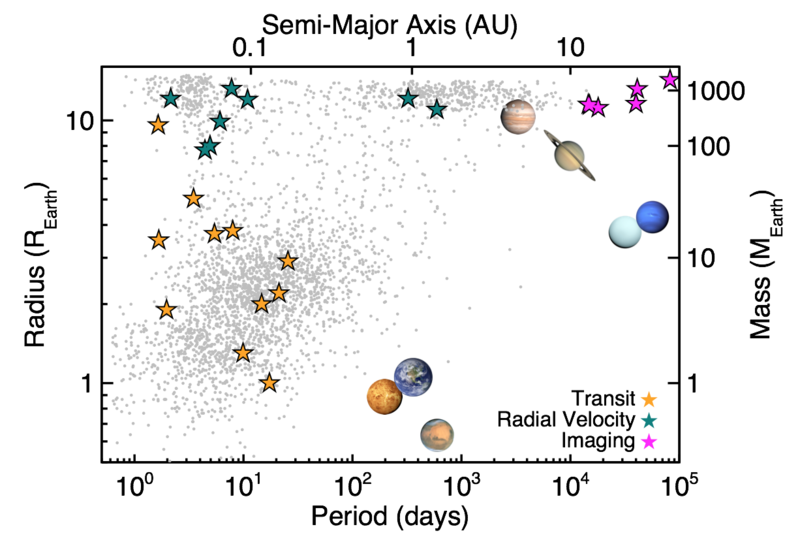 A major problem limiting our search for young planets, as well as general searches for transiting and radial velocity planets is strongly correlated astrophysical noise. This noise cannot be mitigated wth better precision data, and in most cases cannot directly modeled due to a poor understanding of the underlying astrophysics. Examples include stellar rotation and spots, flaring, and magnetic activity cycles. We employ a range of techniques to mitigate or remove astrophysical noise. Our primary method is the `notch' filter, which takes king advantage of the fact that we know something about the transit shape (a 'U' or trapezoidal shape), although our methods can be generalized to any shape for which we have a model. This uses a transit model to build a small notch in the variability fit. Assuming a transit is present lets us use an extremely aggressive stellar variability fit algorithm without removing a real transit, or allowing transits to bias our stellar variability fit. In cases where the stellar signal is too strong or the planetary signal is too weak for individual notch triggers we can use a star-driven method (we call LOCOR). Here we fit stellar variability with linear combinations of other regions of the light curve. Essentially we are using the light curve to fit out itself. The danger is that, if the stellar and orbital signals work on similar timescales, the transit can be removed or the signal weakened. However, we can correct for this in our occurrence rate estimates noting that such instances should be extremely rare. Top: example of the notch filter technique. This assumes a trapezoidal 'notch' is present in the data to avoid removing a real transit with an aggressive pipeline. Bottom: demonstration of LOCOR pipeline to fit stellar variability. 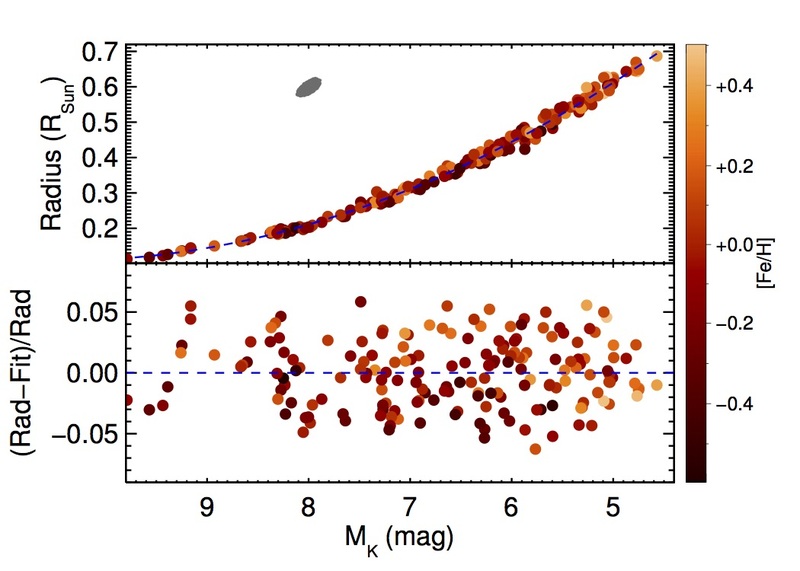 The relation between absolute K magnitude and stellar radius for M dwarfs (top), and the residual of the best-fit (bottom). 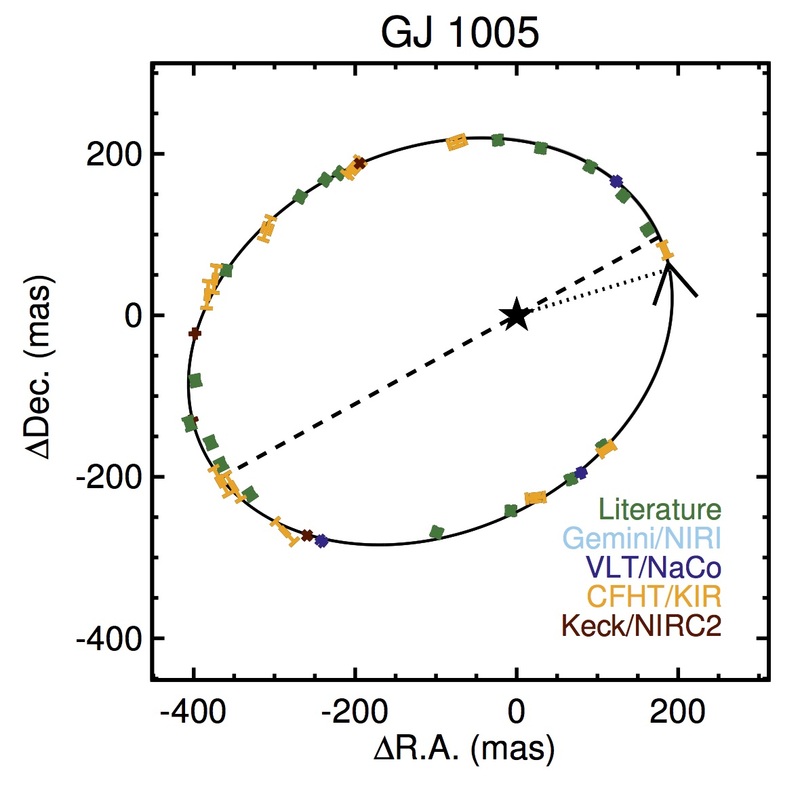 Orbit of the M dwarf GJ 1005AB. With an orbit like this, we determine the mass of the system and explore fundamental relations between M dwarf masses and other properties (temperature, luminosity, activity, and metallicity). Cool, late-type dwarf stars (M dwarfs) are attractive targets for planet searches because their small size and low mass facilitates the discovery of smaller and less massive planets. They are also by far the common star in the Solar Neighborhood (about 70% are M dwarfs). A disproportionate number of Habitable-zone and Earth-like planets are around M dwarfs. Despite their importance in both Galactic and exoplanet studies, their parameters are poorly understood compared to their Sun-like counterparts. Their cool atmospheres enable the formation of complex molecules that are hard to model and make traditional methods to estimate stellar parameters difficult. We focus on estimating M dwarf parameters using 'touchstone' stars, for which we can estimate their parameters empirically. This includes stars with radii from long-baseline interferometry, masses from dynamical orbits or binaries, and luminosities from a parallax and the broad-band spectral-energy-distribution (SED). With large samples of touchstone stars, we can then explore the relations for M dwarfs, including the fundamental mass-luminosity relation. This also lets us calibrate empirical relations between easily measured parameters (like absolute magnitude) and fundamental properties (like effective temperature and radius). Such relations can then be used to assign parameters to much larger samples of stars where direct measurements of their radii and masses are not possible.